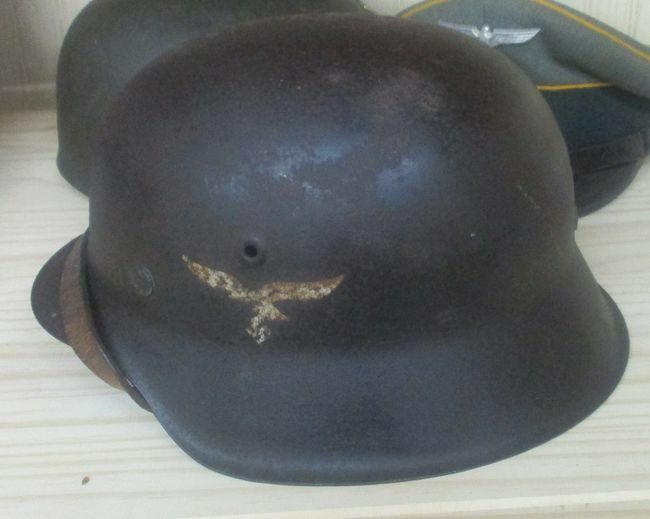 Â NS66 marked Luftwaffe helmet with 90% of its wartime blue-gray textured paint. I canâ€™t make out the lot number under the paint. The decal has even light wear, perhaps 80% intact. The liner shows some use and the helmet has been worn with a faint name, but no damage or tears and thSe chinstrap is complete.Â Overall condition is typical of an uncleaned house find, a bit of cleaning would bring out the finish and decal, but I leave such things to the new owner.Â I seem to find SD LW helmets from time to time but I donâ€™t see many M42 models! $500.00 and $12.00 USA postage or $35.00 Airmail. How much to send to NZ? Can you send a close up of the decal please? It's one thing to look at it with your mouth open, but it's better to shoot it gritting your teeth! I buy U.S. Medals and Militaria from all era's. Above all learning, always learning!